If you haven’t yet, start planting summer vegetables now. The sooner you plant, the sooner you’ll have a harvest. A wide range of crops can be put in now. It’s not yet too late to put in early vegetables like artichokes, corn, green beans, New Zealand spinach, and early tomatoes. Cucumbers and both summer and winter squash can still be planted. And of course you can plant the crops that go year-round, such as carrots, radishes, beets, chard, and turnips. You can even start putting in the real heat lovers this month, such as peppers, lima beans, melons, pumpkins, eggplant, and okra. Provide adequate light; plant vegetables in full sun. Without it they’ll succumb to disease and fail to flower, and you won’t get a crop. Lay out your vegetable garden to make the best use of sunlight. A good rule of thumb is: plant tall crops to the north and short crops to the south, and arrange your rows from north to south so the sun goes from side to side across them. If you really want to grow vegetables but do not get full sun, try lettuce, potatoes, asparagus, and herbs. Tomatoes will bear a crop with just four or five hours of midday sun in a warm, sheltered location, especially if it also provides reflected heat. 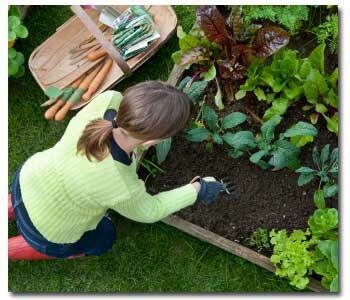 Provide good soil and drainage; vegetables need deep fertile soil with adequate drainage. Sandy or decomposed granite loam is best. If you have red clay, adobe, or almost pure sand, don’t despair…there are soil amendments that will allow you to enjoy great veggies as well. If your soil is rock hard or drainage is nil, plant in raised beds that are filled with top soil mixed with a good soil amendment like Gardner & Bloome® Soil Building Compost. You may choose to use a mixture of good soils, ask a Grangetto’s Garden Expert on your next visit which soils are best for raised beds. Finally, decide on a watering system. The furrow method is good, especially with heavy soils, but it wastes water. Overhead sprinkling can work early in the day, but it can be bad along the coast, where excess moisture on leaves, cool temperatures, and a moist atmosphere may encourage fungus growth. The best way for modern gardeners to water vegetables is with a drip system. Most vegetables need the equivalent of an inch of rain per week for healthy growth. Drip systems use 40-60 percent less water by putting it where roots are. It can seem like a lot of work, but the bounty of the harvest is well worth the effort!